EVA (foam) flooring is a very hot trend in marine flooring. It has expanded from providing a non -slip surface on swim platforms to covering all types of surfaces on the boat including hull sides. The main attraction is that it does not absorb water. But is it right for you? That depends. If you use your boat to any extent, while trendy, this flooring is not a great solution. It has very low wearability. From regular use, it soils easily and is almost impossible to clean. If a ski fin, a cooler or an anchor is drug across it, indention’s or gouges appear. Bring your boat to a mechanic for work and you can be sure the floor will be damaged. Look closely at the pictures below – these are from brand new boats on display at the Miami International Boat Show in February 2019. 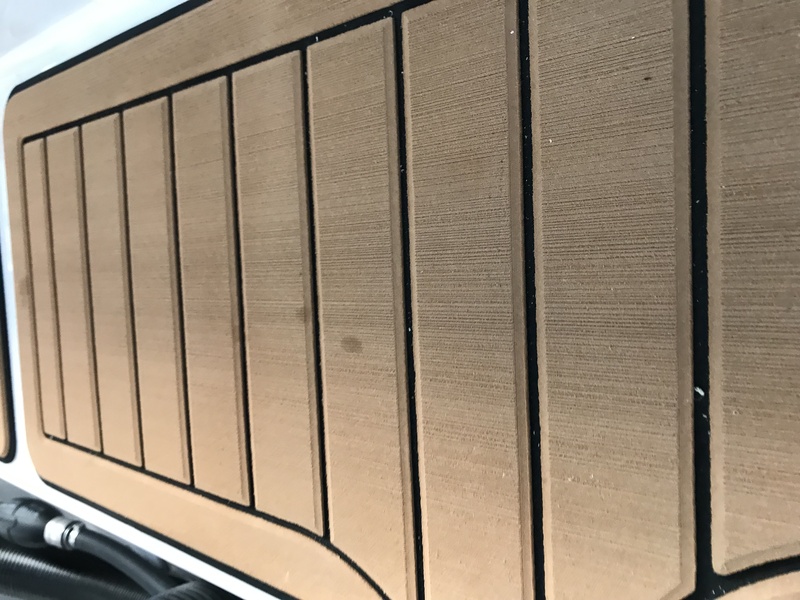 If the material shows this type of staining and wear on boats that haven’t left the showroom floor, imagine what happens after just a few hours on the water. Since EVA flooring is directly glued to the surface, it is no easy task to remove it. You often must hire someone for assistance and because it is so labor intensive it is very costly. Chemicals are used on the surface to get all the last bits up, and even then, the non -skid can be ruined. What would be a better alternative? A removable AquaMat® using Corinthian’s AquaWeave™ is a perfect solution. 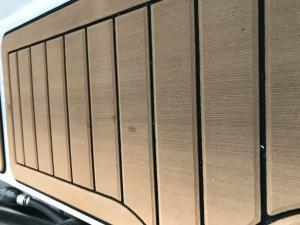 It is a woven vinyl that does not stain, does not absorb water, does not stick to the deck and can easily be taken out of the boat before hitting the shop. It looks beautiful too because is styled to easily coordinate with any boat interior. Check out the many options including a variety of teak looks at https://corinthianmarine.com/aquamat/. Before you cover up that fiberglass with EVA be aware of the many issues associated with this material. It may be popular but there are more affordable solutions available that will perform better and stay looking good longer. After all, don’t you want The Best Walk on Water?